Watercress, in Greek called “kardamon = κάρδαμον”, (Nasturtium officinale), is an acquatic plant which is usually used in salads or to make soup. I am going to keep this post short. I just broke my promise to myself not to post more than two posts a week as I was planning to post one for another friend’s event by the end of this week but I still have time for that one. However, on a visit to my friends’ sites earlier, I visited Laurie, of Mediterranean Cooking in Alaska and who is one of the first friends I made when I began blogging. Laurie is the host of this week’s Weekend Herb Blogging, created by Kalyn of Kalyn’s Kitchen and if you have not yet visited Laurie’s blog, you still have time to submit your recipe and “taste” her delicious Mediterranean dishes. Yesterday I had some business to attend to in another municipality of Athens and in the street the building was, there was a Farmers’ Market going on. I am not going to whine about happene but I eid go through an ordeal! When I finished, I could not resist buying a few things such as strawberries and rocket (arugula). When I paid for the rocket I noticed that he was selling kardamo (watercress) Nasturtium officinale. That intrigued me as I had never seen this herb before and asked the man how this could be eaten. He told me that I could make a salad, just the same I would use rocket (arugula). I paid for it and when I was about to leave he added “You give some of this to your husband to eat and you will not regret it. Better than Viagra”. I assured him (smiling) that my husband did not need it and I could see some people giggling with the joke and left”. When I returned home, it was quite late and I had to grill Some Greek mpiftekia (burgers) I had prepared before leaving in the morning and I wanted to make some salad. I made a quick google search for “watercress and rocket” but I could not find anything with fresh watercress. I checked what else I had at home. I had spring onions, parsley, tomatoes, cherry tomatoes and lettuce. I decided to use the cherry tomatoes and the spring onions. I washed all the vegetables and let them dry. When I prepared the salad and added the vinaigrette I tasted it to see what it was like. If you think that rocket has a peppery and tart taste then watercress has an even more peppery, tart and bitter taste and imagine both these greens together. I looked for something sweet to add but the only thing I found in my closet was a packet with four leftover dried figs and some walnuts. I added them to the salad and although the cherry tomatoes and the figs balanced the taste, it still needed something more. I remembered seeing strawberries in other salads so I added a few strawberries in my plate and that gave the perfect balance. I think it was exactly what it needed.Although I heard a few jokes from my daughter, like “salad and dessert together” my son and husband tried it and they loved it. (Now don’t ask me about the after effects). Wash and drain all the vegetables. Cut he spring onions, rocket, watercress, cherry tomatoes and strawberries into smaller pieces. Cut figs and crush walnuts to small pieces. In a container with lid add oil, balsamic vinegar, apple cider vinegar and honey and shake well. Add dressing to salad, salt and pepper and toss to coat evenly and serve. In a container with lid add oil, balsamic vinegar, apple cider vinegar and honey and shake well.Add dressing to salad, salt and pepper and toss to coat evenly and serve. Only the Greeks! LOL at the market man. Salad sounds amazing Ivy. I’m curious when you say “fresh” cardamom do you mean that it came in the little “pods”/shells? I love peppery flavours and rocket is perfect for this. This is a fascinating recipe Ivy. I’ve never seen or heard of eating fresh cardamom, so it was also very educational. I’m so glad you decided to blog about it – and it is a PERFECT entry for Weekend Herb Blogging. Thanks! Thank you Laurie, what I forgot to mention in the post is that we have a verb derived from this plant “cardamono” which means we become invigorated, gain strength etc., so this means that it is full of vitamins and whatever other qualities it might have to give you stamina. Panagioti, I put a new picture on the post for easy reference. Very interesting salad ingredient. I love watercress but use it only in soups! Now, I will definitely try it in salads as well. Thank you Kalyn, so it seems that apart from me a lot of people do not know fresh cardamom. Hey sis, I know that it is called arugula but I prefer to call it rocket because it sounds more to the Greek word which is “ROCKA”. I have never seen watercress beore but the way you have described the salad and the flavours its very very appetising… a whole lot of goodies!!! Thank you Elly. When you come to Greece you will now know what kardamo is. In India cardamom is a spice. It is grown in the southern parts of India where I have not been able to visit yet..and thus even I use the dried cardamoms for cooking and especially in desserts and tea where it leaves nice sweet fragrance.. I have never used watercress in salads before but now I will definitely try it. Although I have some cardamom pods I do not know how to use it. Swati, I will check your blog for inspiration. Now this is one inspired salad. I don’t think I have ever seen watercress before. If I ever do, I now know what to do with it. Hi Ivy, this is an interesting combination of vegetables for a salad. Hi Lisa I am sure you will like it. Beautiful salad Ivy – I think tht the figs and walnuts in the dressing make it. That’s really interesting–It’s weird why watercress is called kardamo in Greek. It reminds me of the cardamom pods. Sounds like it must have been a great salad! Rosie, you are right we never stop learning. I had never heard of it either. Cakelaw, at least the figs did. The walnuts were nice and crunchy but this salad definitely needed something sweet. Mike, yes it is. I am only now starting to know cardamon pods and the aroma is just fantastic. What a delicious salad! I would go for the contrast with the strawberries too! Also didn’t know about watercress. Never seen it over here. Je, je, Spanish farm sellers would say this kind of things too!!! Hi Fearless kitchen. Nice to see you over here. It seems that nobody knows about this green, including myself as it was the first time I ever saw it. Huh – I’ve never even seen watercress before. It looks like a great salad. If I ever see fresh some I’ll know what to do with it! 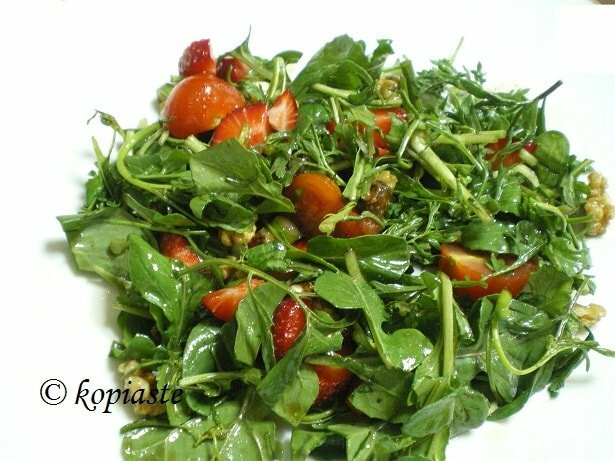 Hi can anyone tell me where I can get some watercress leaves in cyprus as I am intrested in putting this salad on my menu, thanks.